This article is about the IF Comp 2009 game by Matt Scarpino. For the ChoiceScript game entered in IntroComp 2012, see Resonance (Nereida Scales game). You don't know who or where you are at first -- your head is painfully buzzing -- and a woman's voice inside your head is telling you she's trapped in a lab at Psychodyne and that you have to get something she left behind our picture, and stop them. Then: silence. You're in a bar. After talking to the bartender, who is also your brother Steve, you learn that you are James Drayton, a hungover ex-private investigator whose wife disappeared and who lost his company to his ex-partner. You have nothing to your name but the house you haven't visited in ages, a small metal key, a foul-smelling suit, disheveled hair, and twenty dollars. And a car. Steve offers to take you wherever you want to go. Resonance (Matt Scarpino; 01-Oct-2009; Glulx). IF Comp 2009: 7th place of 24 entries. 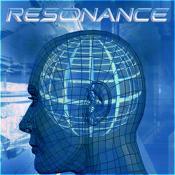 Resonance (archived) - at Baf's Guide. Resonance - at ifwizz interactive fiction (in German). Review and review of reviews by Conrad. Review: 1 and 2 by Jeremy Freese. Review by JonathanCR - at IFDB. Review by David Monath - in SPAG. Download resonance_walkthrough.html from the IF Archive. Walkthough by the author.